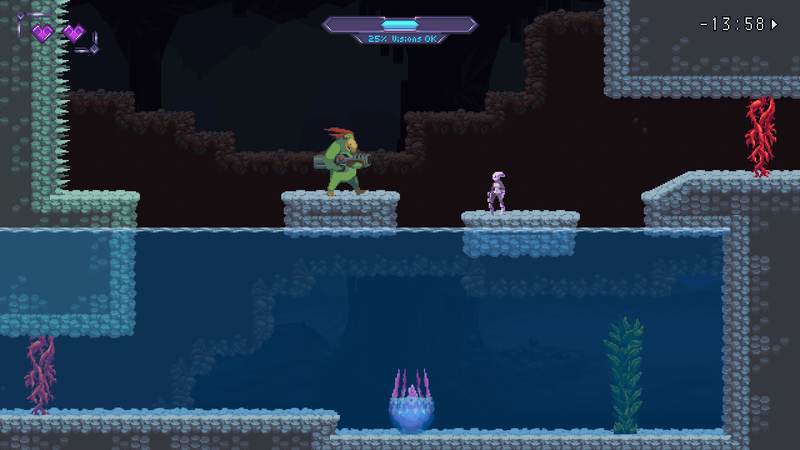 Peer into the future in this time-travelling metroidvania. 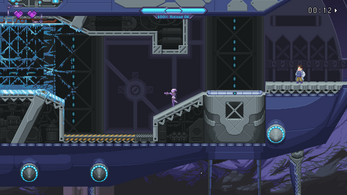 Run, jump, shoot and more through varied environments as a clairvoyant cyborg on a mission to prevent a looming planetary disaster. It's a classic 2D action-adventure revamped with modern sensibilities and a plethora of new mechanics. Revert time with ease to solve puzzles, undo damage taken and cheat death. 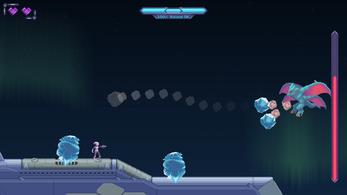 View visions of enemy attacks a second before they occur, giving you a unique edge in combat. Manage varying "timelines" in the adventure with the innovative Time Tree system. 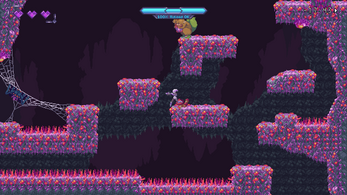 Concise level design that trims the fat and respects the player's time. Diverse puzzles that make creative use of the player's abilities. Hidden techniques can be used to complete sections out of order, allowing skilled players forge their own path. Using a controller is highly recommended! Most types are supported. The keyboard is also supported, with rebindable keys. Featuring fantastic pixel art by Arron Johnson and a rousing soundtrack by Will Savino. Check out the soundtrack here! Really enjoying the game so far. Quite a few moments where I had to patch together a proper timeline to follow. 2. Screens that you jump UP into. Jitter + scrambling to get a visual on where to land often ends up with me heading down a screen again. Not great. I'll post again if I managed to figure out how to finish this thing. Thanks again for the game! Loved this concept and design, how is the dev going? It's been about a year and I just wanted to say I hope you pick development up on this again one day. It's such an awesome game and I just finished my second playthrough of it and I can't stress enough how much I love the gameplay and world you built. I'll still be following and I wish you luck! I am impressed. I look forward to playing (and paying for) the finished game. 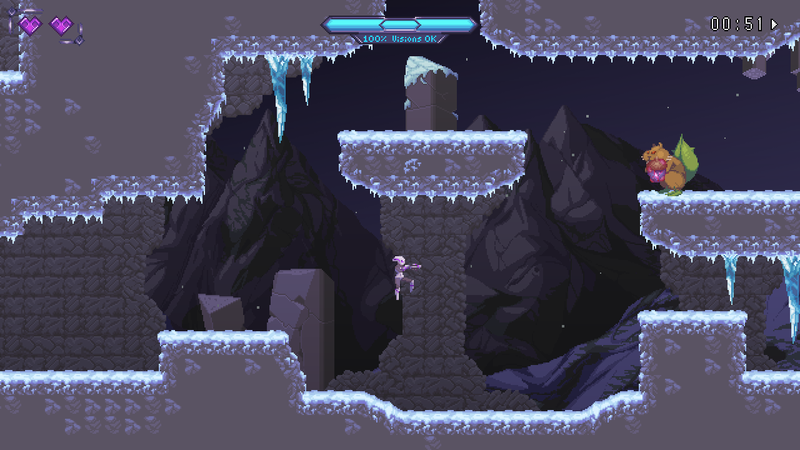 Also, post updates on Gamejolt if you can. 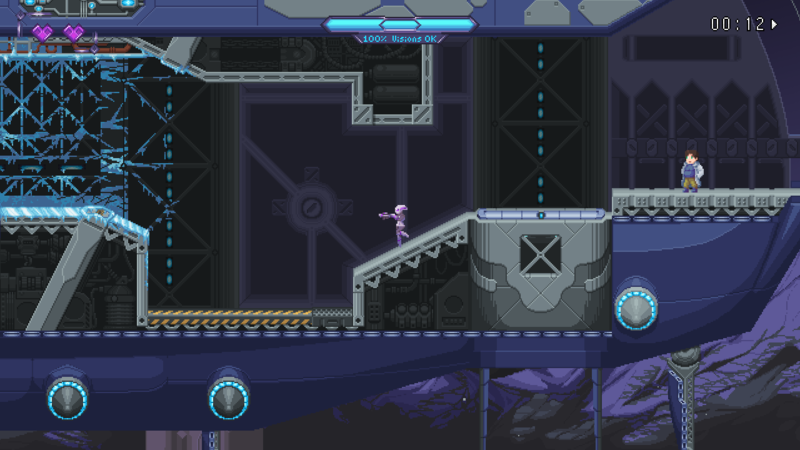 As a fan of platforming games, I am really impressed with your work. The game starting with the boss fight and the rewinding ability reminded me for a moment of Braid, but no I was so wrong. After I got the first ability, I saw that it was much more than that. I enjoyed much the game, as the level design is pretty impressive. The graphics are really cool and I think suit the style of the game, but I had some minor bugs, like the player sprite getting stuck in a fixed angle, or the jumping frog thingy animation playing even when on ground. I enjoyed the mechanics, especially that you can jump back in time, while keeping your abilities (but the hearts tho :( :D ). Although, I must say that the keyboard controls are not the best, as I had trouble shooting and jumping while dashing through enemy attacks or lasers, and eventually using the rewind feature. And I have somehow, after a few unknown keypresses opened some debug list (i think) with all the abilities. Better be careful with that when publishing next time. Glad you enjoyed! Thank you for the feedback! This game, in my opinion, is wonderful and has so much potential. I'm as excited about this game as I am with Super Mario Odyssey (And I'm a super huge Mario and Nintendo fan in general, so...) and am really looking forward to playing the finished game. 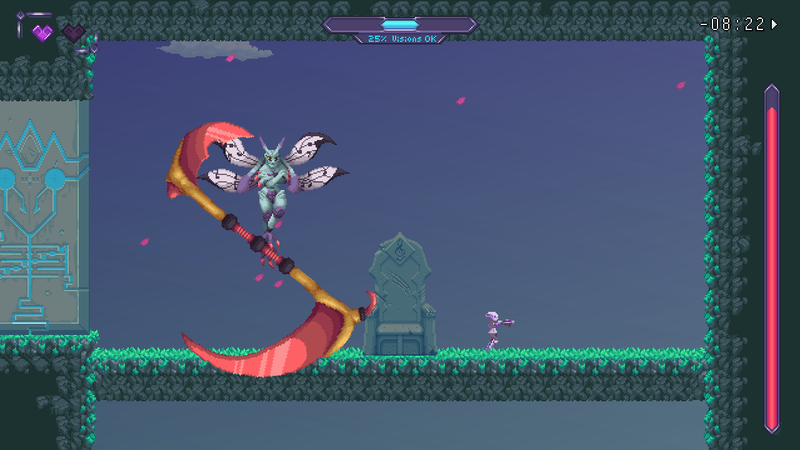 I must say, however, that the game is a bit hard, especially with that new boss fight against the guy with the claw. I might not be a casual gamer, but I'm not a pro gamer either, and this battle proved to be a bit too much for me. As great as the ability to see opponents movements before they happen is, it ended up being more confusing than anything against such a fast and always in motion boss such as him. With so many things going on this quickly on the screen, I couldn't help but feel quite overwhelmed. Nonetheless, the boss battle is still very epic and I appreciate the fact that the game is very forgiving when it comes to dying. In the end, it still is a fantastic, unique and promising game that would definitely deserve as much recognition as great video game franchises like Metroid or The Legend of Zelda. Thank you for the feedback, I'm glad you enjoyed it! The game is really cool but also quite hard at times. Especially some of the ambush scenes are quite hard, especially after you just did some parcour which cost you like most of your health. Also was stuck after a while when the "linear" path had ended. Took me ages to realize that you can skip back in time without losing information. And even then, it was not always possible to know where to go. Also quite often I came to situations where I wasn't sure wether I needed a certain upgrade for that situation. Or if I was just doing somthing wrong. Only after I realized that time skipping is possible, did I jump back to a point without electricity and moved on. Only ages later did I come into a room where i got the info about being able ti time skip (you know that certain dialogue). Well it isn't like i could have used that information back then when I was stuck after activating electricity, heh? Now when I have finally figured stuff out on my own, I finally get told that information? Well don't need it now anymore anyways. Especially the bird with the 4 explosives, can't hit him most of the time. Merely determination and persistency enable me to overcome it. And a hit and hide strategy. Still, looking forward to the full game! Any ideas when it will come out? Glad you enjoyed it, despite the difficulty. You played it in a creative way if you managed to turn on the lasers before learning about the chamber flashbacks. I'll try to make that more clear. It might be another year or two before the game comes out. Thanks for playing, glad you liked it! I'll consider making the dodge longer. This is amazing! Definitely looking forward to playing the complete game, I would love to contribute do you guys have a patreon account? Thanks! I don't currently have a patreon, but I'm open to the idea. If you really want to donate you can "purchase" the demo but there aren't any donation incentives or things like that, so please don't feel obligated to do so. I don't usually donate to stuff, but I'll move my budget around for this. This is legitimately one of the few games I'm actually excited for. 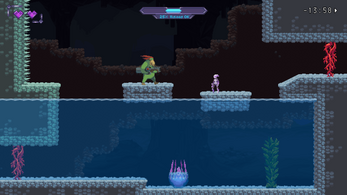 Not too many good Metroidvania's that are more metroid like out there, and even fewer that bring something new to the table. You've got a for sure buyer here when the full game comes out and hell even with the demo (once pay day comes around that is). Please keep it up! And do consider that Patreon if it isn't undue pressure! Thank you! Though it'll be a long while before the full game comes out I'm sure you'll enjoy it! Despite this being a demo I hope that this does get finished and I had a lot of fun playing what there was of it. I also made a video that I hope makes itself useful for you on your quest to make this a full game. Really fun game. Can't wait to play the completed product. This game is super cool! I'm so happy I saw this, I'll definitely be watching for future updates! Any updates on Kid Icarus? Is it complete or is more work needed? This game is awesome. Keep it up. I can't wait to play the full game. Really cool game but kind of needs more checkpoints. The demo was amazing! Plays really well, gratifying movement and combat, as well as a great premise that's genuinely exciting. Can't wait to see where this goes! The demo plays amazing, I hope the game goes far. My only complaint would be the inconsistent style, with the first fight's text feeling pretty awkward. This is an amazing premise for a game! The story telling is very well done, the controls and jumping is smooth and the gameplay idea is clever. I like how you almost have to worry more about how much vision you have remaining than your health. Is there a plan for controller joystick support? I like the D-Pad motion but I kept finding myself moving back up to the joystick to try to move the player and getting stuck. Great game all around otherwise! Very professional looking! I'm glad you like it so far! Analog stick motion was considered but I found it made moving while aiming very jerky and awkward, so only the dpad is enabled. Although I could probably make this sort of thing toggleable in the options for the players that want it. With the main chars speed+the way she sticks to the ground it almost feels really stiff. I can't really put my finger on it.... kinda robotic in movement. The dodge helps that a bit though once you get it. Annnd timers.... That might kill this for me. I loved the original 2d metroids (The 3ds are good as well but totally different concept). Used to spend hours and hours searching the levels at leasure, in almost a zen and relaxed state. This feels panicked and a bit rushed in comparison. Thats just me though, I like to take things slow and have time to think. Thus, perma timers (the ones you gotta deal with the whole game) always hurt games more than help em in my opinion. All in all, Good stuff! I hope the finished game has a way to slow down the timer though.... Maybe somthing along the lines of stabalizers that are hard to find and even harder to activate but add 5 mins to the total timer for eatch run. Thanks for the feedback! I agree the portraits can look better, and you can expect them and other various assets to be polished up before release. I had a feeling the timer might be controversial with some fans of the genre, but I'm confident it's a twist that'll make the game more interesting. 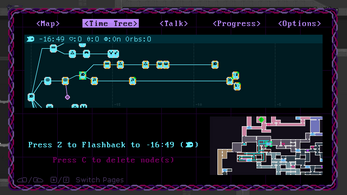 It fits well with the time reversion mechanics and encourages speedrun-like tactics, like planning routes and finding shortcuts. But I agree that it shouldn't impede exploration, as long as the player knows what they're doing. The time limit of 20 minutes is certainly not set in stone, I won't know for sure until the entire world is made. It's very likely there will be difficulty settings with varying time limits as well. I really enjoyed this game because it reminded me of playing metroid when i i was little and i'm happy to see that games like metroid still exist i made video here!